All but one in this final row are by Mutable Instruments, and all but three are 2018 releases. Three songs on the upcoming album were done on this row alone. Starting at left, Mutable Instruments Marbles is a humdinger. The left half generates three trigger streams, from a steady clock to a jittery one to drum patterns and random variations; it can use its own timing or follow an incoming clock or learn rhythmic patterns. The right half generates random CVs synchronized to the left half or an external clock; it uses a clever quantizer that filters notes by probability, which you can train by playing pitch CVs into it. It can also sample CVs from an input and distribute them according to its clock timing and shift register logic. For each side, you can engage “Deja Vu” which plays the rhythms and/or CVs in a loop, with an adjustable probability of altering that loop each time it plays through. There’s also another random CV generator just for kicks. It may sound like a lot of complex stuff, but it’s mostly easy to use and the results are fantastic — it made me change my mind about modules that generate random signals. To me it’s a great partner for Teletype. 5/5. A shift register passes a value along a chain each time it is triggered, in “Row, Row, Row, Your Boat” fashion. Some variations on shift registers feed back into themselves in order to generate repeating or chaotic patterns; linear-feedback shift registers (LFSR) were used in the 80s to generate noise for arcade games. Sporting six sliders, Stages is a very versatile modulation source. Each segment can be set to ramp, hold, or step behavior, and segments can be grouped together by patching in gate signals. In an intuitive way you can patch simple or complex envelopes, LFOs, sequencers, sequential switches, delays, sample-and-holds, slews, manual sliders, and combinations of those. You can run audio through it to make it a little grungy and/or filter it, or generate chiptune-like audio. You can chain multiple Stages together, or to itself for the “Ouroboros” easter egg mode, a harmonic oscillator (I haven’t tried that yet). Extremely cool and very well designed, especially good for smaller systems but useful everywhere. 5/5. Plaits is the successor to Braids, the company’s first big hit in the Eurorack world. A digital oscillator with 16 different synthesis models, each with three parameters, and many having cool variants on the secondary output. It also has a built-in decay envelope and LPG, so it’s possible to use it with a minimum of other help. As I’ve said previously, it’s a very good partner for Rings. A very solid module. 4.5/5. Fourth and fifth from left I have a pair of Rings, the module that got me into all this. I’ve mentioned it before. I would not have it as the only sound source in my system (that would be Plaits for a tiny setup, or E370 for less small) but I do like it a lot. At least for Materials, it was kind of awesome having two — time will tell if I keep them both. 5/5. With one red knob installed, Shades is a three-channel atteunverter and mixer. Any channel without an input patched generates an offset, and without an output patched, mixes with the next channel. It’s nicely controllable. 4.5/5. The penultimate module is Tides, 2018 revision. It’s a function generator, but one where you can set the cycle time and shape separately. This is perfect for VCO and LFO use, and unusual but functional for envelopes. Tides also has its own filter/wavefolder combination, and a PLL mode that follows an incoming clock or VCO. The 2018 version, aside from being more accurate and having attenuverters for every input, has four modes that can shift the level, phase or frequency (with harmonic relationships) across its four outputs, which extends it capabilities nicely. 5/5. On the corner is Livestock Electronics Maze. It’s sort of a combination matrix mixer (like the A-138m) and sequential switch — there are 16 “pages” of matrix settings which can be selected by buttons, stepped through with a trigger or selected by CV, and it can jump or fade smoothly between them. It’s a thrilling concept, but in practice I don’t find myself using it as much as I thought. I often consider whether I should replace it, but then I come up with scenarios where it was exactly what I needed, and nothing else its size would do. 4/5. 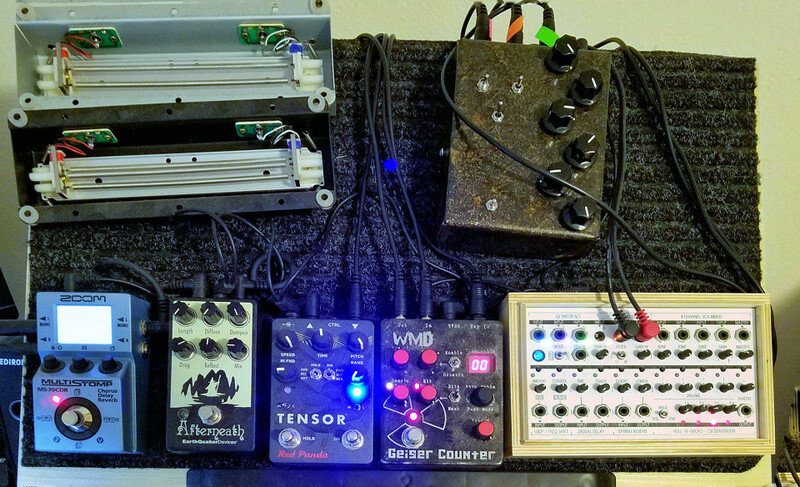 This is the current state of my pedalboard, or really, a shelf hanging over the Mantis at a 45 degree angle. Guitar FX pedals offer some neat alternatives to software-based effects or Eurorack effects, but they run at lower voltage levels generally, thus the need for attenuation before and boosting after to work with them. In the upper left are a pair of spring reverb tanks. I use those with the Koma Elektronik Field Kit FX, in the lower right. 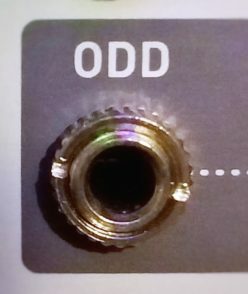 The FKFX has a Eurorack panel option, but it’s pretty wide. Aside from the spring reverb driver, it has a PT2399-based digital delay (cheap and gets weird and crunchy at long delay times, which can be great), a frequency shifter, a 4-input VCA mixer with tone control on 3 channel and overdrive on the fourth, a little modulation source that can be a 4-step sequencer or an ADSR envelope, and four assignable CVs. I’ve used it particularly with the Dynamo for setting up feedback loops with the reverb and frequency shifter. Spring reverb is kind of fun to mess with, but also very touchy to work with. 3.5/5. In the upper right is a Rochambeau Musical Apparatus Monobius, custom 6-knob variant. This is a combination ring modulator and fuzz with bandpass filter. It’s very noisy and odd, and was one of those trades I did on a whim rather than a plan, but it adds some neat flavor. 3.5/5. Left of the FKFX (because on pedals, the signal flow usually goes right-to-left) is WMD Geiger Counter, in a rare distressed black colorway (they are normally screaming yellow). It’s an 8-bit waveshaper, distortion and sample/bit reduction device. With precise enough control over input levels, it is a nice alternative to more traditional wavefolders. 3.5/5. Next is Red Panda Tensor, a sort of quasi-tape looper, pitch shifter, time shifter, reverser, randomizer thing. It is cleverly set up; it listens even when “off” so you can instantly get a reversed repeat of what you were playing; it can judge when to (smoothly) reset its buffer to prevent overflows when you’re playing back repeats more slowly than they came in, and so on. Sometimes it feels like a human playing counterpoint to me; other times it just makes a neat background wash of stuff, or a sweet chorused sound. Its stomp switches are the non-clicky type (and can be switched between momentary and latching), which I prefer since I don’t use it with my feet. 5/5. Then there’s EarthQuaker Devices Afterneath. It lives somewhere between delay and reverb. with a little chain of echoes that can be diffused. It’s very easy to get infinite feedback going with it and keep it under control. The minimum pre-delay time is longer than I would prefer, which limits the flexibility a little. A nice non-clicky stomp switch on it. 4/5. And finally there’s the Zoom MultiStomp MS-70CDR. It’s a multi-effect with several classic and modern versions of chorus, delay, reverb, and other modulation and a few utilities like EQ, noise gate and compressor. With three push encoders and an LCD screen it’s a little friendlier for my purposes than some multi-effect pedals, but it’s still occasionally just a little bit tedious to set up. The processing is pretty great, the sound quality can be a bit noisy at times (as guitar pedals sometimes are) but not terribly so, and the price was fantastic for something this flexible. 4/5. I have a Chase Bliss Dark World on preorder, which should ship around the start of the year. It provides three reverb algorithms on the “world” side, and three effects on the “dark” side to add gloom or shimmer or the infinite void. You can run the two sides in either order or in parallel and there’s a master tone control to darken it more if need be. The demos have been impressive, and I may see this replacing the FKFX (thanks to a spring reverb model) and maybe the Afterneath too. Hopefully a 5/5…?